Removing the backslash worked for me. You can confirm your operating system recognizes the correct path by checking $LD_LIBRARY_PATH. I get it from here. 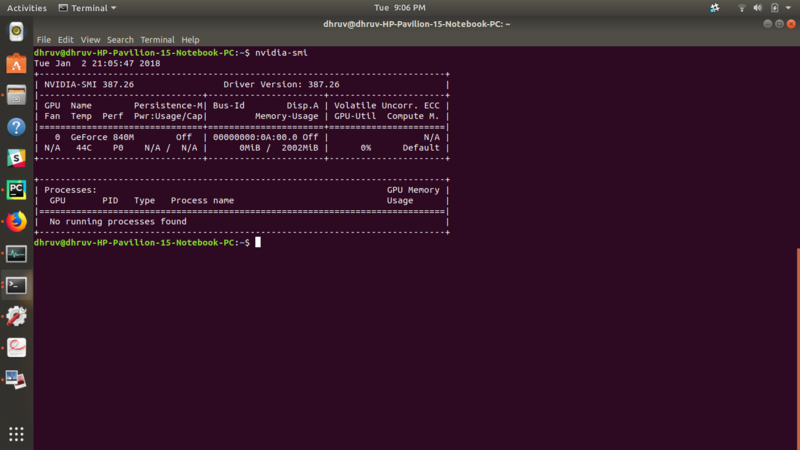 i have installed cuda 9.0 and operating system is centos 7. I just want to know which version of tensor flow will support cuda 9 and centos 7. Also please let me know which version of cudnn should I install? At last i found a resource that really works. Thanks for this. Please remove the unnecessary backslash from last line. @EICT321 You might be moving too fast... it might work, but I don't think they official support 9 yet. https://www.tensorflow.org/install/install_sources list tensorflow versions and their tested configurations. I have tried to add the LD_LIBRARY_PATH as instructed and i am still getting the 'libcudnn.so.6: cannot open shared object file: No such file or directory' error.This is a screenshot of my ~./bashrc file and Nvidia-smi screenshot. Do let me know if there is anything else i need to try. In case running nvidia-smi throws the following error, just try rebooting. That seemed to work for me. This script works by the way! Ubuntu 16.04.3 represent here. I successfully installed Cuda 8.0 and cuDNN 6.0, without running into any problems with the display/graphics like I usually used to. I highly recommend using the package manager installation over the runfile method. GPU TensorFlow now requires cudnn 9.0. Anyone have an updated link for 9.0? @JohnAllen Did you find a updated script for GPU tensorflow?